There was a huge support from the business community. The event was Presented by Sanjay Tax, Powered by You Smile Dental and PNG jewelers was the Grand Sponsor, Gold Sponsor was Apex Consulting, Visitors Guru, Urban Spice (Food Sponsor) & Other Sponsors include CalHomes-RamanaReddy, Paatasala, Syed Ahmed (Realtor), NewYork Life & Academy of Problem Solving (AOPS), Virijallu radio, Bolly 92.3 FM & Yo India were the Media Partners. The venue decorations captured the Telugu New Year, Ugadi spirit. The entry of the venue was packed with vendor tables with variety of Indian traditional jewelry, clothing, real estate, financial & tax services and food. Ugadi Pachadi was served to mark the beginning of the Telugu New Year. Harinath Chikoti,Varun & Hari Sannidi helped with registration and ticketing. 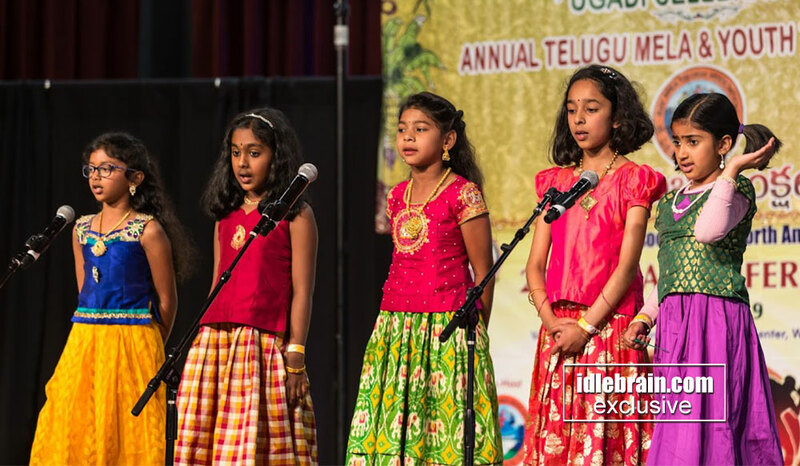 There was an overwhelming response to the competitions this year and they were conducted in two separate halls with over 300+ kids enthusiastically participating in classical, folk/ film singing, dancing and special talent. The judges had a very difficult time to pick winners. Sumanth, Kondal & Arun took care of coordination. The main cultural program started at 5:00 pm. Vijaya Aasuri (BATA Advisor) warmly welcomed all the guests and the curtains opened to showcase performances by over 100 kids covering dance forms of world in the segment “Jil Jil Prapancham”, BATA cultural team conducted practices in various locations. The dances were choreographed by Srilu, Sirisha & Deepthi. Comedy skit Naakenti (నాకేంటి) a hilarious take on how we fall for deals without reading the fineprint. This was written & directed by Kalyan Kattamuri. “Nri Sainma - Chapter 1” A visual & musical extravaganza that depicted the journey of NRIs who come to US with dreams and hopes and how various situations play into their daily lives. The funny undertone, unexpected twists coupled with amazing props was received with thunderous applause. The dances were choreographed by Sanketh, Aditya, Sindhu & Uday. Paatasala team was recognized on this occasion; Paatasala is an initiative by Telugu Times and BATA to promote and teach Telugu language; Dr Ramesh Konda (Director) introduced the teachers & coordinators. Finally, the much awaited and one of the highlights of the evening, Popular Tollywood singer Sunitha’s live concert. 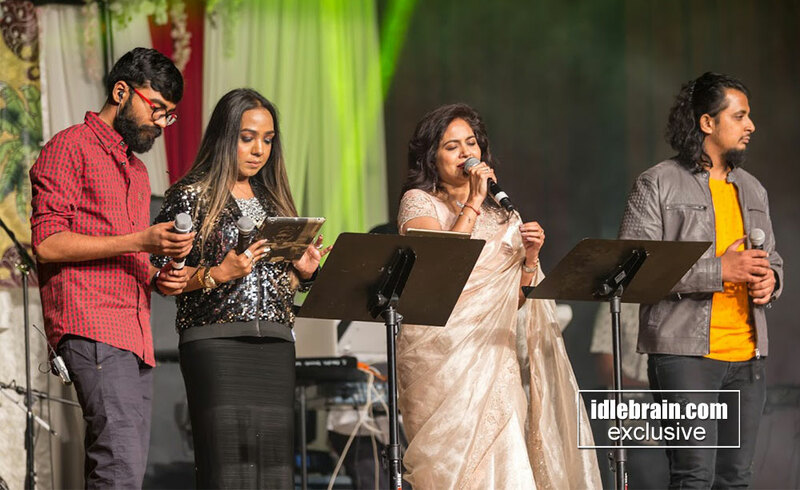 She was accompanied by Bhargavi Pillai, Dinkar & members of Capricio Telugu band from Hyderabad. The team presented Super / Duper hit songs and the crowd thoroughly enjoyed the songs and applauded & encouraged the singers. It was a very lively & refreshing program. Veeru & Karun handled the Audio set up. BATA president Yaswanth Kudaravalli, thanked the audience and participants for making this yet another grand event. He applauded all the volunteers for toiling hard and thanked Bata team for their support. Speaking on the occasion TANA members, Satish Vemuri, Rajani Kanth and others informed about the TANA conference and invited them to attend. “Steering Committee” includes, Ravi Thiruveedula, Kamesh Malla, Kalyan Kattamuri & Sirisha Battula. “Cultural Directors” includes Sridevi Pasupuleti, Srilu Veligeti and Taraka Deepti. “Nominated Committee” Varun Mukka, & Hari Sannidi. BATA “Advisory Board” Jayaram Komati, Vijaya Aasuri, Veeru Vuppala, Prasad Mangina, Karun Veligeti and Ramesh Konda congratulated the team for making the program a grand success.